At Lu’s Labs, we have foster homes in the South and foster homes in the North. Most of our dogs start their journey into Lu’s Labs by being pulled from a shelter or an owner surrender and going into a home with one of our southern fosters. This month in our Volunteer Spotlight we want to tell you a little bit about one of our rising stars in the south, Sarah Underwood in Kiln, Mississippi. Sarah and her daughter Katie have big hearts and while they have 3 resident dogs and a cat, they still have room in their heart and their home to foster. Sarah’s job can be quite intense at times and sometimes heart breaking as a Probation and Parole Agent for the State of Mississippi. 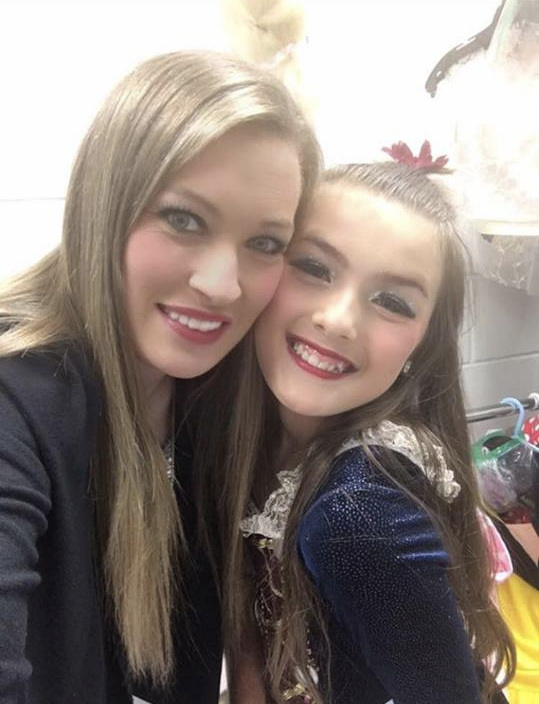 On a regular basis Sarah donated to her local shelter for years, but as she and her daughter wanted to do more they researched other ways of getting involved and decided they wanted to give fostering a try. When Sarah and Katie took on their first foster, Chevy she was still learning the ropes of rescue, and at first, she didn’t realize just how lucky Chevy was to become a Lu’s Lab and just how life changing this would be for him. As a southern intake foster, Sarah picks up her fosters from the shelter, gives them the love they deserve, gets them healthy and takes them to their medical appointments making sure all their paperwork is complete. All this gets them ready for transport up north, and to a new life. It is especially rewarding to Sarah to work with the dogs and help the dogs who have been broken down come out of their shell and be the happy, playful dogs they were meant to be. A day in the life of Sarah and Katie includes early morning wake ups to feed and play with all the dogs, give them their potty breaks and exercise, before they head into their crates before mom and daughter head off to work and school. Once Katie arrives home from school playtime ensues until Sarah gets home from work. Food, belly scratches, cuddles, and more playtime before bed are a must. You don’t have to be in rescue forever to decide to work with Lu’s Labs. Just the willingness to learn and to share in our common goals is important. If you are interested in getting involved whether you are in a southern state or up closer to Lu’s Labs operations in Northern Virginia reach out and let us know. Our volunteers wear many hats, and sometimes they transition to different positions within the rescue. Jennifer McKinley is one of our southern volunteers in Alabama who has been involved with Lu’s Labs since the fall of 2016. She started out working in transport, to help the dogs get from the south to their forever homes in the North, but after Hurricane Matthew, Rebecca Arnold – our VP of Transport planted the seed of fostering for Jennifer, and she ended up taking in a mama dog and her 3 puppies. Jennifer soon became the Southern Foster Coordinator. This job required Jen to vet fosters, make sure they would be good matches for our dogs, and helped the VP of Transport get dogs ready and arranged to transport up from the south. One of Jennifer’s most memorable moments happened last December when Logan escaped from paid transport while Jennifer was at her office Christmas Party. As she learned that a dog had escaped at Tuscaloosa’s busiest truck stop, she immediately left the party and kicked into rescue mode. The entire rescue process is very rewarding to Jennifer, she says, “Nothing beats pulling a dog from the shelter, fostering her, and then seeing her in a new home.” Now Jennifer is much more involved in transport for the rescue, as well as organizing fosters for puppies in the south. Her week starts on Mondays when she takes a look at the dog sheet and works on arranging who is going north by date. She sends out transport reminders, and makes sure all the volunteers have what the gear they need for transport. As the week progresses, she makes sure the fosters have their appointments for health certificates lined up, and gets a copy for everyone’s records. She is very involved with the southern fosters and making sure they have everything they need. When new fosters sign up with Lu’s Labs in the south, Jennifer checks their references and trains them by phone. She also helps match southern fosters with puppies. While each volunteer spends different amounts of time and commitment to the rescue, Jennifer juggles the time and makes it work between her full time job, and her family. She jokes that her family gives her some good-natured complaints at times that she’s on the phone a lot, but they understand that she believes strongly in what she is doing. For those who would like to start out with a rescue, she recommends starting out with a small job that you can do well and then slowly add tasks to that. “Also, make sure that your family is onboard with your involvement or you are in for some arguments down the road.” Rescue is full of volunteer opportunities that can take as much or as little time as you are willing to spend. Jennifer wants everyone to remember that mattresses, shoes, bras, molding and carpets are just possessions that can be replaced. But spending time as a foster whether it’s for a couple of hours, and overnight, or a month of fosters is worth it because you are changing a precious soul forever. If you are interested in getting involved with volunteering there is no small role. We have lots of opportunities, and as Jennifer suggests the best way to start is just to dive into a small position and see how it goes. It may lead to a lifelong passion. It’s that time of the month again where we feature one of our amazing volunteers. All our volunteers are incredible, and it will take many, many months to let you know more about all of them, but this month we are featuring Carolyn Hoskins who wears several hats at Lu’s Labs. Carolyn is the Director of AC Training, she is an Adoption Coordinator, Home Checker, and helps with Transport. As the Director of AC Training, not only does she train all the adoption coordinators, she also receives and distributes all the applications from adopters seeking to bring a Lu’s Lab into their lives. This is a huge task, in that she must read through each and every application and sometimes clarify information before sending off to one of the 40 or so AC’s to begin their process. At times Lu’s Labs can have 20 or more applications in just a week. In fact, last year we had somewhere over 2000 applications and only 360 dogs to adopt. It is a fact that we always have far more adopters than available dogs, due to our limited funding, and foster homes. Carolyn’s dedication speaks volumes about how much she not only loves dogs but believes in the mission of Lu’s Labs. She has always been an animal lover, and avidly followed Lu’s Labs Facebook posts. When a good friend who was also a volunteer, put out a message that Lu’s Labs was looking for Adoption Coordinators in December of 2015, that started her on the road to rescue and she hasn’t looked back. There are always so many memorable and rewarding moments when involved with rescue. One of Carolyn’s favorite aspects of working for Lu’s Labs is getting to know he applicants and getting updates once they adopt. “Seeing what a difference the dog is making in their life, but also getting the opportunity to see the amazing life our dog is leading, is the best feeling!” says Carolyn. In any given week Carolyn is reading through new applications, finding AC’s to process those applications, and keeping herself in the mix by checking vet and personal references and conducting interviews. Recently she trained a new group of volunteers which she says is, “Awesome! The more the merrier!” We are always looking for Adoption Coordinators as well as other volunteers to keep the rescue moving like a well-oiled machine. If you would like to explore the volunteer possibilities at Lu’s Labs, please reach out to us! There is always room for another caring hand. Our Volunteers span the country even though our rescue is localized to a 5-hour radius of Alexandria Virginia. This month’s Volunteer Spotlight falls on Alice Magby who lives in Hamilton, New Jersey and wears several hats behind the scenes that keeps the rescue running. Alice is the Database Administrator, Pre-Adoption Puppy Coordinator, and Home Check Coordinator for the DC Area. She also occasionally acts as an Adoption Coordinator and she handles transports for dogs once they are in the North. With a long history of rescue volunteering, Alice spent 5 years in the high stress roll of coordinating transport for another rescue, where she met Luisa, the founder of Lu’s Labs. Always impressed by Luisa’s dedication to the dogs, Alice kept in touch and was thrilled when she heard Luisa was starting her own rescue. She began volunteering for the rescue in November of 2015 and the rest was history. With so many roles to fill Alice keeps busy with rescue activities but she says every minute and hour she spends is worth it when she sees dogs in need find their forever homes. As most of our rescue volunteers, Alice has her own resident dog love. She has an 8-year-old White German Shepherd named Cotton. In July of this year, she lost his brother and litter mate, Max. While not Lu’s Labs dogs they are honorary members and enthusiastic supporters of the Lu’s Labs family. For anyone considering working with rescue there are all levels of commitment and time investments that can be made to fit your schedule. Like Alice says, “If being a part of a team is important to you, Lu’s Labs is the rescue for you. Our volunteers are gold to us at Lu’s Labs, without them our organization wouldn’t be able to function. Lu’s Labs runs 100% on volunteers and each person brings a special energy and set of expertise to the table. It’s not a surprise that many of our volunteers are often previous adopters, this is the case with Preethi who adopted Watson a very special dog who was lucky enough to find a very special human. Preethi did not wait for that perfect dog who seemed like he failed out of service dog school for being too social. Instead Preethi has been patiently loving and caring for Watson with his anxiety issues. She has taken him in and loved him unconditionally. Preethi has seamlessly fit into the Lu’s Labs family as a volunteer filling a very important role. She keeps the website and the pet finder sites updated. This is no small task as dogs are continually adopted and are replaced with new rescues into the organization. Not only has she taken on this responsibility, but whenever she sees a need to update and improve the functionality of the website she puts in hours of coding time to enhance the website she inherited and put her own stamp of perfection on it. Every time Preethi gets to update the website because of an adoption it brings joy to her heart. “I love adoptions! Every time I update a dog to being adopted, I do a mini celebration with Watson,” says Preethi. In general, Preethi has a lot of fun with her role, she enjoys looking at photographs and videos of the dogs, reading their bios, and researching ways to edit and improve the website. Whenever anyone sees a need on the website and asks Preethi if she can create, fix, or improve something she flies into action making our website more user friendly. If you are interested in getting involved on the volunteer side of Lu’s Labs, please let us know. We are always looking for Foster Families, Adoption Coordinators, Bio Writers, Fundraising Volunteers, Homecheck Volunteers, and so many other places where you can help out. You can put in as few or as many hours as fit your schedule and we always welcome the help. Lu’s Labs likes to spotlight the amazing people who make this rescue work. We have the most dedicated and caring people you will find from the south to the north. This month, let’s talk about puppies and adoption coordinators. Donna McClaugherty, from Gainesvillle, VA, wears several hats here at Lu’s Labs. She is the Director of AC Training, she is the Puppy Coordinator, and she is also a foster. In the last two years, Donna has helped 78 adopters find their fur-ever lab friends. The team work, and being part of a great rescue, is what keeps Donna taking on more and more responsibility. “Some days are crazier than others, especially if I am fostering,” says Donna. “My day consists of booking travel for my clients, calling vets and personal references, and then more travel.” At night Donna usually can be found on the phone again doing interviews, and once or twice a month she trains new Adoption Coordinators. (AC’s) And of course, when she has a foster in the house then play time is a must. Her resident bonded yellow labs, Bailey and Bacardi don’t give much notice to the fosters that come through her home. “They really ignore my fosters after the initial meeting.” They are very laid back couch potatoes and prefer not to play with other dogs.” But they are very tolerant of visitors so they make it a good environment to host new dogs. 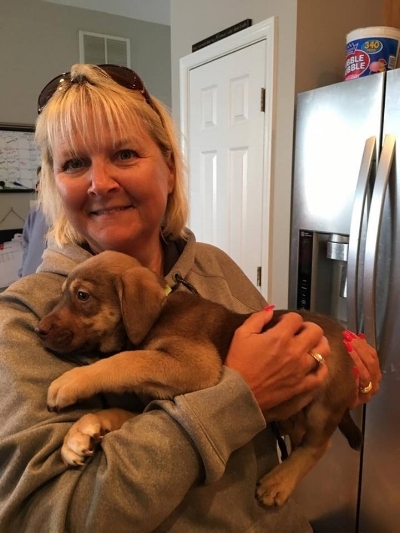 Whether you want to get involved in fostering, or become a match maker between Lu’s Labs and their families, Donna is a great resource and loves what she does. If you’d like more information on becoming a foster, or an adoption coordinator please reach out and talk with us. Committing to just even one dog to foster at a time helps us save lives, and the more adoption coordinators we have, the quicker we can match applicants up with the dog of their dreams. Click below to view posts from any of the different categories listed. Lu's Labs is a 501(c)3 approved foster based rescue, in Alexandria, VA, dedicated to the saving and rehoming of Labrador Retrievers and Labrador Retriever mixes.